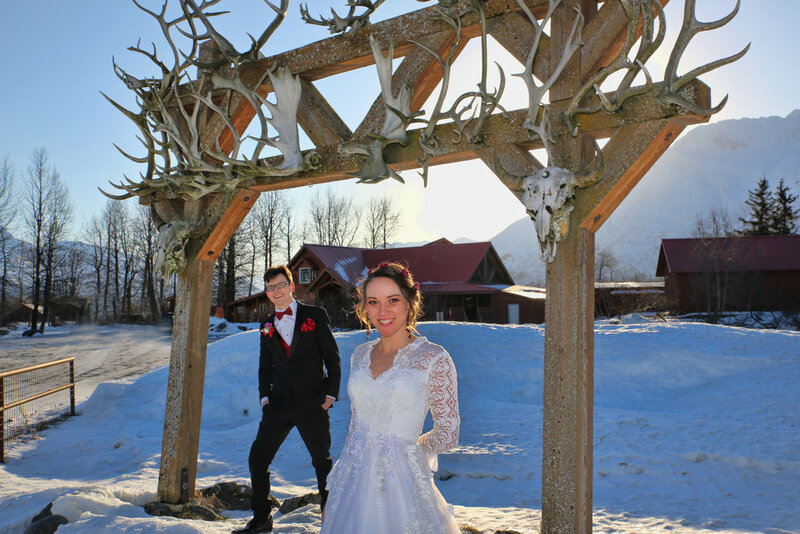 Small winter wedding can be the best in Anchorage. Many people want just that. No pressure, a nice outdoor background with some snow and mountains. Sword fighting and marriage, you bet ! Bring your swords and shields. 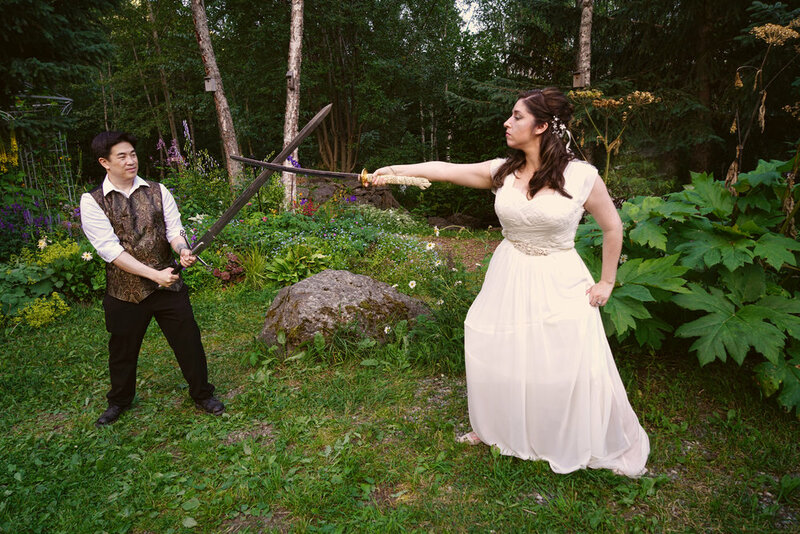 Some wedding, you may not want to say no to the marriage, with so many swords at hand. Indian Valley is the perfect location for a pointed wedding. A place for Kings and Queens. There are parts of the Chugach Mountains that could be a national park. I have hiked to Glacier National Park and have noticed comparisons to the Chugach mountains. The vast mountains, valley and the snowy peaks are all here in your backyard. Just a short drive from Anchorage, Bear Valley is the gateway to these great vista views. Look down into the valley, towards Rabbit Lake with Suicide Peaks in the background. There are hidden hiking trails that follow the ridge-line up to get a grand view of these peaks. These trails are less traveled, no fee stations, just waiting for you to explore. What better time to get some senior photos done with the great weather we have been having? Thanks to Briana and her family coming out to Goose Lake for this photo shoot. The rewards and risks of having a wedding on a glacier can be breath taking. I had the honor of covering a recent glacier wedding on the Knik Glacier. There is nothing better then flying in a helicopter and landing on a blue glacier, the photos are breath taking. But for the groom and bride, certain risks are taken to this type of adventure. The helicopter pilot couldn't land in the best spots for the wedding, as we landed, the ground started to give way, too much water and not enough solid ground. We were in no danger, the helicopter was still at full throttle and we just took off again and landed at another spot. We got lucky the next time and found a firm location and no wind! That is a hard feat to find in the hills, no wind. With glaciers all around you, just a small amount of wind can make this type of wedding short and the weather can turn on a dime on any mountain top. Renting a helicopter is very expensive so couples getting married want the best weather. You can only cross your fingers and hope that the weather will hold out to get the photos, because down the road, years from now, that is what they will be looking at. So as a photographer, the game is on, get those photos, test the ice and snow for the wedding party, hope that the wind doesn't come hollowing down and keep your fingers from freezing off. I hope to see you at your next glacier wedding, that is the best wedding one can have, so close to the ice and snow in Alaska.